The Concord Coalition is a respected non-partisan source of information on the risks and consequences of a growing federal debt and unsustainable fiscal policies. We work around the country educating, engaging and empowering citizens to take action as fiscal lookouts. In Washington we encourage elected officials to work together to put the country on a more responsible path that will hold down the debt, foster economic growth and strengthen the nation. The national debt, already quite high by historical standards, is projected to grow rapidly. The aging of the population and health care costs are driving up government spending and revenues are not projected to keep pace. Across the country we present budget exercises, forums and other educational programs. We also engage volunteers to provide factual information and facilitate discussions in their communities, encourage local media coverage and press their elected officials to support budget reforms. The Concord Coalition is a nationwide, non-partisan, grassroots organization advocating generationally responsible fiscal policy. The new report reiterates GAO’s past warnings about the federal government’s budget problems and the lack of responsible action -- and then discusses how things have gotten worse since the last such report was issued only 10 months ago. 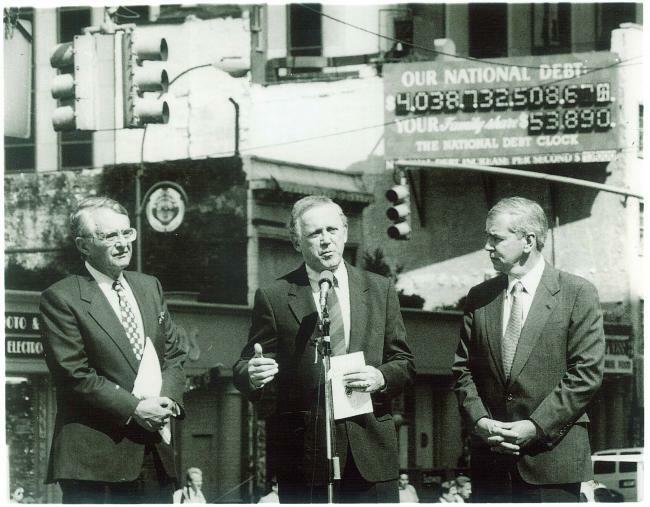 Our founders announced The Concord Coalition under the debt clock in New York City. The Concord Coalition, founded in 1992, is a non-partisan organization that advocates putting the national debt on a sustainable course and protecting future generations. Concord’s founders believed, like the Minutemen at Concord, that we have a moral obligation to leave the country better off for our children and grandchildren. Our founding co-chairs were former U.S. senators Paul E. Tsongas (D-Mass.) and Warren B. Rudman (R-N.H.). Former U.S. commerce secretary Peter G. Peterson was the founding president. Our current Board of Directors and regional advisory groups include former members of Congress and state legislatures, recognized experts on the federal budget, and business and civic leaders. Americans say they put a high priority on strengthening the country and looking out for the next generation. Yet the federal government is on an irresponsible and unsustainable fiscal path, with spending programs growing more quickly than the economy can keep up with and tax revenues projected to chronically fall short of spending -- even in relatively good economic times. This leads to an ever-growing debt burden. We believe, and our experience as an organization has shown, that when Americans are given non-partisan, straightforward information about the nation’s fiscal future, they understand the need to make budgetary tradeoffs and will push their representatives to make hard choices to set the nation on a sustainable fiscal path. That is why we work around the country educating, engaging and empowering citizens to take action. Why should you care about the federal budget? Join our mailing list for the latest news, analysis & more. The national debt is already quite high by historical standards, and government projections show that it will continue to grow rapidly and to levels substantially higher than ever in history. The aging of the population and rising health care costs are driving up government spending and revenues are not projected to keep pace. The debt could rise even more rapidly if elected officials move forward with additional spending programs or tax cuts without “paying” for them through other budgetary changes. This debt growth will damage the economy, undermine our standard of living, and leave our children and future generations worse off. Procrastination only makes the problems more difficult to address. The sooner we deal with them, the better. When faced with a challenge as complex as the nation's fiscal future, it can be easy to feel helpless and discouraged. The numbers involved can seem intractable and the problems may seem daunting. But there are things YOU can do to help America’s fiscal future! One of Concord’s main goals is to stimulate honest discussions about federal finances that transcend partisan politics. We are determined to communicate with and empower American citizens to change the direction in which the country is headed. The Concord Coalition can help you start this discussion with your neighbors, colleagues, and elected representatives. It is easy to stay involved! Attend Concord events in your area, educate others, write letters to the editor, join our social networks and donate! Some of The Concord Coalition’s most important tools for educating the public about the federal budget and the nation’s fiscal challenge are our budget exercises. We are pleased to announce that “Principles and Priorities,” “Debt Busters” and the online “Federal Budget Challenge” have all been updated to reflect the most recent projections and cost estimates from the Congressional Budget Office. Browse Concord's public and private events to get a sense of what we're doing around the country. No events are in the immediate future, but check back soon.